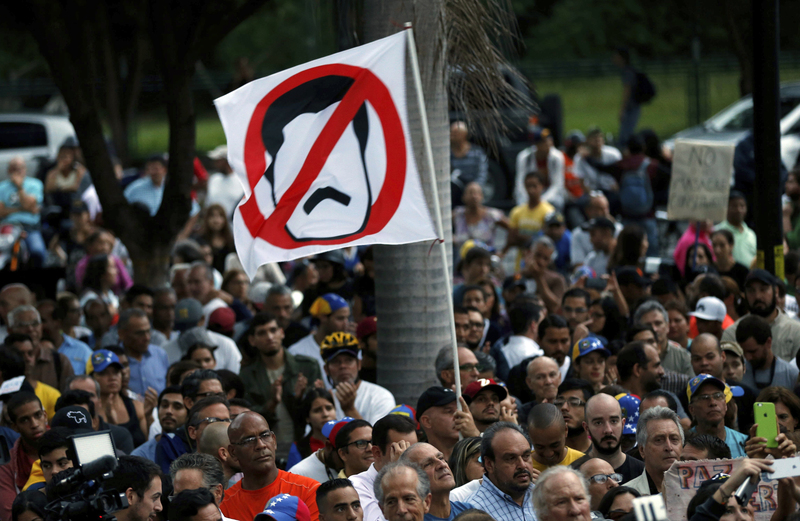 CARACAS, Venezuela (AP) — Venezuela’s president defiantly dismissed allegations that official turnout figures for the election of an all-powerful constituent assembly were manipulated, accusing the international software firm behind the claim of bowing to U.S. pressure to cast doubt over a body that he hopes will entrench an even more staunchly socialist state. In his first meeting with assembly delegates Wednesday night, President Nicolas Maduro not only stood by the official count of 8 million-plus votes cast in Sunday’s divisive election, but proclaimed that an additional 2 million people would have voted if they hadn’t been blocked by anti-government protesters. The body is empowered to rewrite Venezuela’s constitution and Maduro vows he will use it to target his opponents and solidify the socialist system installed by the late President Hugo Chavez. Maduro called the vote in May after weeks of protests fueled by widespread anger over food shortages, triple-digit inflation and high crime — unrest that continues and has caused at least 125 deaths. The head of voting technology company Smartmatic said earlier Wednesday that the National Electoral Council’s voter turnout number was off by at least 1 million, further darkening uncertainty over the veracity over the results. Independent analysts and opposition leaders have contended that the actual participation level was much lower. With the opposition boycotting the election, virtually all the candidates were supporters of Maduro’s ruling socialist party, so turnout was watched as one of the only indicators of how much popular support there is for the constituent assembly. Maduro provided no evidence to support his claim, but his remarks were received with resounding applause from about 500 people elected to the assembly. Antonio Mugica, CEO of Smartmatic, told reporters in London that results recorded by the company’s systems and those reported by the National Electoral Council show “without any doubt” that the official turnout figure was tampered with. But he did not specify whether his company’s figures showed 1 million fewer, or 1 million more, voters. The international software company has provided voting technology in Venezuela since 2004. Tibisay Lucena, the head of the National Electoral Council, also dismissed Smartmatic’s claim. She called it an “opinion” of a company that played only a secondary role in the election and had no access to complete data. “A company located outside the country does not guarantee the transparency and credibility of the Venezuelan electoral system,” Lucena said. Even before Smartmatic’s statement, there were growing questions about the official turnout count. Leaders of the opposition, which is supported by a sizeable portion of the population, argued that the turnout number was inflated. And an independent exit poll concluded that less than half the government’s figure actually cast ballots. The opposition-controlled National Assembly voted Wednesday to urge the nation’s chief prosecutor to investigate election commission members for potential crimes. “They are going to install a fraudulent constitutional assembly and no one can say with certitude that these people … were those who won or if they were the product of a scheme,” said congressional leader Julio Borges said. Luisa Ortega Diaz, the nation’s top law enforcement figure and former government loyalist who has fallen out with Maduro, told CNN late Wednesday that her office would investigate. Mugica said his company’s automated election system is designed to show when results are manipulated but requires that a large number of auditors participate, from both the ruling and opposition parties, which he said did not happen during Sunday’s vote. “This would not have occurred if the auditors of all political parties had been present at every stage of the election,” he said. Smartmatic, which supplies services worldwide, was founded by Venezuelans in Caracas and began providing voting technology during Chavez’s presidency. In the past, opposition members have questioned the validity of results, but the firm has maintained its impartiality. Luis Vicente Leon, president of Datanalisis, a Caracas-based polling agency, said Smartmatic’s finding was, “without a doubt, the most devastating pronouncement yet for the credibility” of the nation’s electoral council. Despite the unrest and plummeting popularity ratings, Maduro appears to have maintained the full support of the country’s most important institutions, notably the armed forces. Top military figures have been given special status and are scattered throughout the government. They also are in charge of strategic areas such as food distribution in which Venezuelans say bribery is widespread.